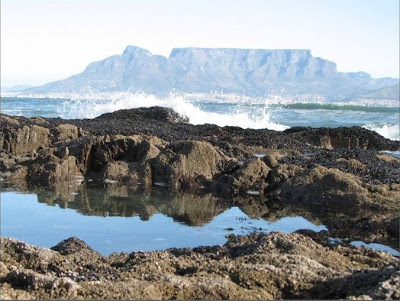 Last weekend we decided to take a drive through to Blaauwberg for lunch and some photography. A visit to Doodles Restaurant, a pubby little place with good food, a boisterous clientele and rather slow service filled the hollow and a couple of beers set the mood for a long walk on the beach and a few photographs. 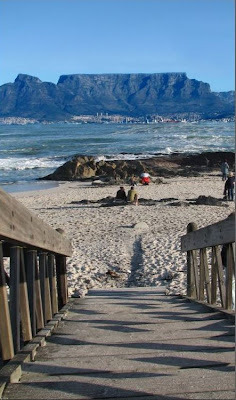 Blaauwberg beach is the vantage point from which the familiar “trademark” picture of Table Mountain is usually taken. So many photographs of “our” mountain have been taken from this vicinity that it has become something of a “photographic cliché.” To try and produce something fresh and interesting was the challenge we set ourselves. Here are two of the many pictures we took. Do you think we succeeded? We will probably post one or two more in a day or two.